It’s hard to believe that Spring is just one week away. The sun is slowly winning the battle over the cold and snow and our thoughts have turned to warm afternoons spent out in the orchard, ideally eating handfuls of berries. The goats enjoying a tasty treat of pear tree trimmings. This has been an eventful winter. One of our favorite times this winter was our time spent at the annual PASA Conference held in State College. This was a jam-packed two day event full of seminars on every imaginable topic on sustainable agriculture. The attendees are as varied as the topics, from Amish folk to hippies. Kat contemplated dreds for at least two weeks afterwards but I talked her out of it. At the conference I mostly attending soil health topics while Kat focused on animal husbandry. We were exhausted (in a good way!) at the end of two days. I also had the opportunity to attend the Real Health Conference held at Lancaster Ag. I spent the day listening to Michael Phillips, an author and proponent of holistic orchard management. It again was a wealth of information but was exciting to hear from a person managing an organic apple orchard. The remainder of the winter has been spent reading as well as attending our Beginning Commercial Tree Fruit Course put on by PSU. I appreciate the course and the information, but the majority of the content is focused on conventional production rather than organic. It’s really hard to find good sources of information on organic production where folks are doing it on a larger scale. Still, we’re up for the challenge. Winter was a rough one this year. Okay, maybe rough is an understatement. Things started out okay in December but goodness, once the snow really hit it didn’t leave until, well, this week. Mid-to-late February ran a good 15-20 degrees below normal for the average highs and I believe we might have even set a record low or two. Still, on the whole, the winter didn’t seem as severe as last year’s and we only hit -3F (yea, only -3F, but at least it wasn’t last year’s -5F!). Snow cover remained intact for pretty much the entire cold period so I’m hopeful that it will help some of the borderline plants to survive the cold. This reddish-gold fig wood is pretty but it means the majority of the limbs have died. Still, healthier gray wood survives below the snow line so I'm holding out hope! There were a number of our plants put to the test this year. Spring will tell the full story of how they fared, but I expect the story with our figs to be close to the same as last year: almost completely top-killed. Still, I expect most to survive and push up again from close to ground level. My curiosity is centered on our Asian persimmons, rabbiteye blueberries, and the Salavatski pomegranate. I've done a few scratch tests on the bark of each of these and everything looks good so far, much to my surprise. Last year we lost the flower buds on all but one Asian persimmon, Great Wall, which happened to bear a great crop for the year. Okay, Saijo also produced one fruit, but that really doesn’t count. I’ll be curious to see how the plants fared this year, especially some of the newer cultivars that had just one year in the ground. 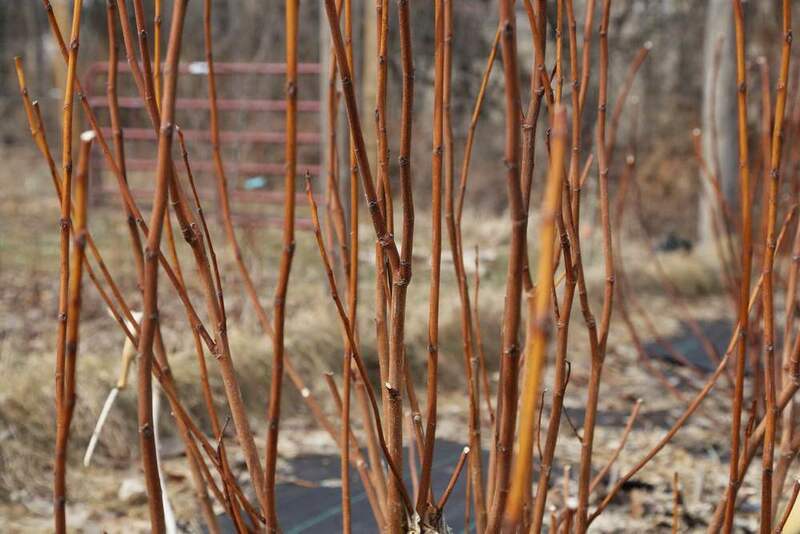 I also picked up a number of rabbiteye blueberries this past year and planted them. Supposedly they begin to start experiencing damage at 0F with major damage and death around -5F. They’re in a somewhat sheltered location so this should be a good test for them. Our Salavatski pomegranates are another curiosity this year. Supposedly they can stand around -8F in a protected area (like against a house), but ours are out in the open in our orchard (a bit wind-sheltered, but still). With -5F last year they all died to the ground (or close to it) but resprouted like crazy last summer and grew quite a lot. With a less severe winter this year and another year in the ground, perhaps they’ll fare better. This honeyberry is already beginning to bud out. It's one of our hardiest, earliest fruiting plant and its blooms can purportedly withstand 22F. Verdict is still out on the fruit, though. So what IS reliably hardy even in these two harsh winters? Pretty much everything else we have planted. Pears, apples, northern highbush and half-high blueberries, currants, lingonberries, honeyberries, and most raspberries seem to shrug off this kind of cold like it’s nothing. Pawpaws, jujubes, and stone fruits are much the same and would likely be okay down to at least the negative teens (though peach and apricot flower buds don’t necessarily survive this cold). Blackberries seem to vary on location. At the orchard where I worked, some the blackberries froze out last year while others did much better. At our own orchard I didn’t see any damage, even on some late-planted varieties that I had considered perhaps borderline (Kiowa and Osage). The bare red-purple canes of the black raspberry contrast beautifully against our fence. 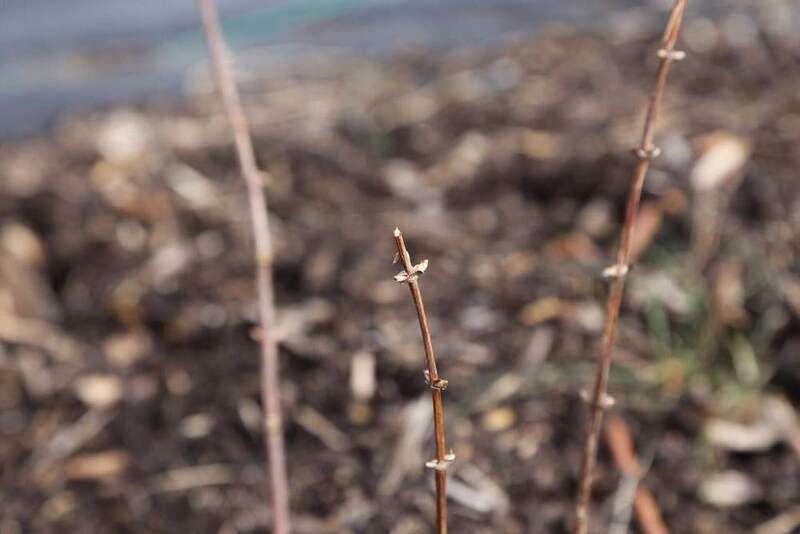 So what’s on tap for the growing season? Lots! This year our efforts are focused on soil health and infrastructure. The PASA conference this year really underscored for us the importance of establishing a healthy soil: one high in organic matter and biologically active. Since the field we’re planting in has been farmed conventionally for quite a while we’re not sure of its condition. We’ll start in the spring with a soil test to assess where we’re at, then proceed with a cover crop rotation through the spring and summer to both build up soil organic matter and jump-start the soil biology. We also plan to have the goats graze the cover crop via moveable pastures. Infrastructure is another big part of what we’ll be focused on this year. We’ll be tearing down much of the existing electric fence that runs the course of the field and either replacing it or changing it over to an orchard fence to keep the deer out. 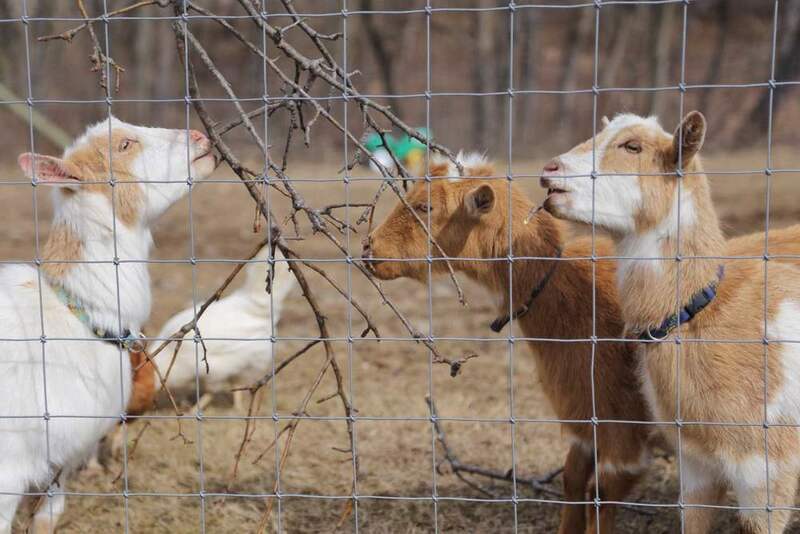 We’ll also be fixing up the existing wooden fencing to move our goats or chickens over to the farm. We should pretty much be experts in fencing, and completely tired of it, by the end of the growing season. Irrigation is another big project this year. We were blessed to have a functioning irrigation well already on the property from its days as a tree farm. We’ll fix up that system and run main supply lines to various spots in the orchard to set the stage for planting next year. Finally, we’re readying our nursery area to begin growing out our production fig trees as well as those we’ll have for sale. We’ve also ordered native trees to help landscape the wood line around the orchard and enhance the beauty of the landscape. What would a new year be without some new plants to try? It seems like each year we experiment with a few more new plants or at least a few new cultivars of plants we already grow. So I know by all reasonable measures we’re growing enough figs. Though another way to look at it is if we’re currently growing around 80 varieties, what’s 3 or 4 more, right? This year we’re trying out Sodus Sicilian, Bisirri #3, Petite Aubique, and LSU Champagne to see how they fare here (likely in pots). We’ve grown just two varieties of pomegranates so far, Salavatski and Kazake, and are branching out to try a few more. Salavatski and Kazake are purportedly some of the most hardy varieties, withstanding some dips into the negatives and making them mostly hardy for our 6b/7a climate zone. We’ll try out some earlier fruiting varieties this year to evaluate them for early production: Ambrosia, Azadi, Eversweet, Kaim-anor, Kaj-acik-anor, and Suhr-anor. What else? We received some seeds from a supposed Iranian lemon, which are growing nicely. I confess, I have a love/hate relationship with citrus. I love the evergreen leaves and the smell of the blossoms, but I can never seem to overwinter them all that well. I’m also curious about a recent introduction, the Sherbet Berry (sounds good, right? ), Grewia asiatica. It’s supposedly deciduous and fruits on new wood like figs. However it may not stand up well to freezes so I’m not sure how we might overwinter it, even in pots. Daffodils display signs of life in our garden. Spring is not far off! It’s finally warming up after a steadily cold winter. All this cold may end up being a blessing in terms of later bloom times and suppressed insect populations. Look for an update from us in the next month as plants slowly begin to wake up. Enjoy the remainder of winter everyone, the busy season is just around the bend! We look forward to serving you this coming season. So what do you guys do all winter?